For all Windows 32-Bit and 64 Bit operating systems. Make an impression with a professional presentation on CD, DVD, USB ! ...make no mistake, if your needs are listed above, CDMenuPro autorun software is the right choice for you. Set yourself apart from the competition with an attractive and clearly designed Autorun CDMenu. Just imagine the impression you will make on your users when your CD presentation starts automatically. Download your free 30-day trial version and create your first CDMenu project. It goes without saying, of course, that the success of the business presentation will depend on how much impact your presentation makes. As well as making it attractive and professional, it is also essential to remember the old adage that first impressions count. When your customers insert the CD or DVD into their drives, you want them to be presented with a clear introduction frontend menu giving them all the options available. You certainly don't want to be making them search through all the files in the hope of finding your presentation. Getting off to a good start is essential, after all you don't want to annoy your users before you have even gotten started. A smooth and well presented introduction enables your presentation to shine through. Why do you need a CDMenu / Frontend Menu ? An entirely amateurish impression is made by portable media not furnished with an Autostart application which informs the user directly about the medium's type and contents, and serves to guide the user. Users should never have to be responsible for figuring out which program or file to click on to obtain the desired information. 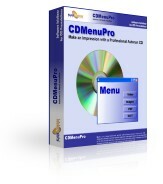 CDMenuPro is a Windows software which lets you create a professional user interface (CDMenu) for your portable media (CD, DVD, USB stick). The CD Menu application provides buttons, menu bars, pop-up menus and selection boxes for starting your presentations, documents and programs. Placing no limits on creative freedom, this technique allows you to fully integrate your company's or product's Corporate Design. Why should you decide to use CDMenuPro to create your CDMenu / Frontend Menu ? Isn't it time you invested your time in designing an impressive and creative menu for your CD rather than wasting hours reading manuals or getting to grips with complex software. CDMenuPro has been designed to create all the files necessary for the autorun feature, to support a large number of trailers such as AVI, Intro, Sound, Splash Screen and to start programs and documents such as Pdf, Html and PowerPoint presentations reliably from your CD. CDMenuPro Version 5 was launched with additional software. ArchiveSafe has been designed to enable you to password-protect sensitive files on CD against unauthorized access. CDMenuPro is being used across the world by thousands of users and has won a large number of awards. Start today and create your first self-made CDMenu. 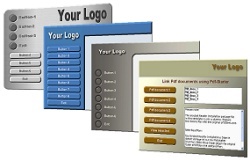 Set yourself apart from the competition with an attractive and clearly designed autorun menu. You are permitted to use and include the rtf, html, text and image-file viewers on your CD on a royalty-free basis. The same also applies to the starter programs included for Pdf and PowerPoint presentations. CDMenuPro also comes with an Icon Converter, Button Creator and Resource Browser incl. templates, as well as a comprehensive online support service. The Windows operating system comes complete with a feature that automatically starts programs when a data carrier is changed (such as when a CD ROM is inserted). The information needed to do this is contained in the "Autorun.inf" text file. Autorun, autoplay and autostart are different terms for the same function, that is, the function that starts a program automatically when a data-storage medium is changed. As far as the Windows operating system is concerned, there is no difference between a CD and a DVD. Both are data-storage mediums with different storage capacities, the only difference is the way in which they are recorded. All of the information given on this website applies to both CDs and DVDs. A CDMenu has a graphic user interface and provides an interactive way for users to navigate computer programs. It makes it possible to choose and activate a particular action from a list of possible actions without having to know or use the exact command strings in text form or keyboard shortcuts. An autorun menu is a special kind of menu that is used for CD ROMs or DVD ROMs on computers running the Windows operating system. The autorun feature of the operating system is used to open a menu window automatically when a CD is inserted into the CD drive. A program for creating and editing CDMenu applications. Autorun, autoplay and autostart are three different terms for the same function. When a CD is inserted into the CD ROM drive on a Windows Computer, a program is started automatically. A multi-media presentation is one of the most common uses. If the CD contains several presentations or documents, it makes good sense to start the CD with an autorun CDMenu, which tells the user about the type and content of the CD and which can be used to start the presentations, documents and programs with the help of buttons.